Flying Vehicles - aka Flying Cars, Flying Motorcycles, etc. FAR/AIM - there are many different suppliers, but I like the ASA version. Cessna 172S Information Manual (on-line examples: 172S 6-Pack, 172S G1000) - You'll need a hard-copy for use in class. Either the 6-Pack or the G1000 (aka NAV III) version will do, you do not need both. History of the E6B or How did the E-6B get it's name? Aeronautical Chart User's Guide - every chart symbol and notation explained! FAR/AIM.org - Lots of useful information related to the FAR/AIM. EAA - Experimental Aircraft Association - a great aviation organization that you should consider joining. AOPA - Aircraft Owners and Pilots Association - a great aviation organization that you should consider joining. AOPA Air Safety Institute on-line courses, quizes, videos. etc. The FAA Private Pilot Knowledge Test contains 60 questions and you are allowed 150 minutes to complete the test. FAA-CT-8080-2F - Computer Testing Supplement for Private Pilot - This is the booklet containing all of the diagrams, charts, etc that are used during the test. JATO Aviation - Aircraft rental, flight training & charter operations out of SQL, PAO, HWD, and LVK - includes the Pilatus PC-12! FAA AFD - on-line AFD pages! RunwayFinder.comInteractive up-to-date sectionals with WX etc. Great article about Airspeed, Vne, flutter, and related issues - bottom-line: The Airspeed indicator lies when it comes to Vne and flutter! Barnstormers.com - "Aviation's Busiest Marketplace"
Geared Drives - Automotive Conversion Engines and PSRU, using the Chevrolet LS1, LSJ, etc. Aircraft Annunciator Model AG6 - Programable annunciator in 1.25" x 1.0625" of panel space! Aviation Helmets - the leaders in aviation helmets, flight suits, etc. Aviation Survival - helmets, flight suits, etc. Kitfox Aircraft LLC - makers of Kitfox Super Sport "Fly Away S-LSA"
Pipistrel - makers of a range of composite aircraft, including the virus motor glider that flies like a regular powered aircraft (but no medical required). Aerovations Unlimited is a Pipistrel dealer located near Denver (call to coordinate a visit / demo flight). The following list of companies and aircraft is the result of my own research into possible building options. This list is clearly a sub-set of what is available, but it probably covers at least 90% of the most viable or interesting kits (or plans). Those listed run the gamut from just plans (you must procure and/or fabricate everything yourself) to quick-build kits requiring minimal assembly, and everything in between. Prices range accordingly, from a few hundred dollars for plans to well over $100K for a two or four-place quick-build kit. I have tried to eliminate companies and/or aircraft that have serious questions of viability, safety, or support but inclusion on this list does not in any way endorse either the company or aircraft - Caveat Emptor always applies. Manufactures with a large (mostly happy) customer base and many years of existence are noted in bold since they have a track-record of builder completions and, evidently, a generally appealing design. Manufactures with a smaller customer base, or fewer years, may offer a fine product and/or support but they lack the buyers/completions/years to be able to judge their long-term viability. Manufactuers listed in italics are ones that you may want to spend some extra time and effort researching before getting involved with them since their background seems shorter, or their reputation more varied, than the other manufactures. Arion Aircraft - Makers of the Lightning high performance LSA and Experimental. Bearhawk Aircraft - Makers of some very impressive backcountry aircraft, including a four-place hauler. MakerPlane - an open source airplane project with a target price of $15K for a two-seat LSA - airframe, engine, and avionics included! Plane Driven - Convert a Glasair Sportsman to a flying car! Sonex Aircraft - makers of very affordable aircraft kits, including the sub-Sonex personal jet aircraft for $125K! SubSonex by Sonex - A Personal jet Aircraft!!! MakerPlane by MakerPlane - an open source airplane project with a target price of $15K for a two-seat LSA - airframe, engine, and avionics included! SRT Helicopters - Full service helicopter company based in Bakersfield with special training for Mountain Flying, Long Line, Special Operations, etc. Helistart - Kit Helicopters - List of "all models"
Britta Penca (blueskygyros@gmail.com, 520-840-0951) gives gyro instruction in her Tandem Air Command at San Manual Airport in AZ. Mike Burton (gyroinstructor@gmail.com, 801-794-3434) is a gyro instructor at Airgyro Aviation at Spanish Fork Airport in UT. See his Airgyro Aviation Facebook page for the very latest. 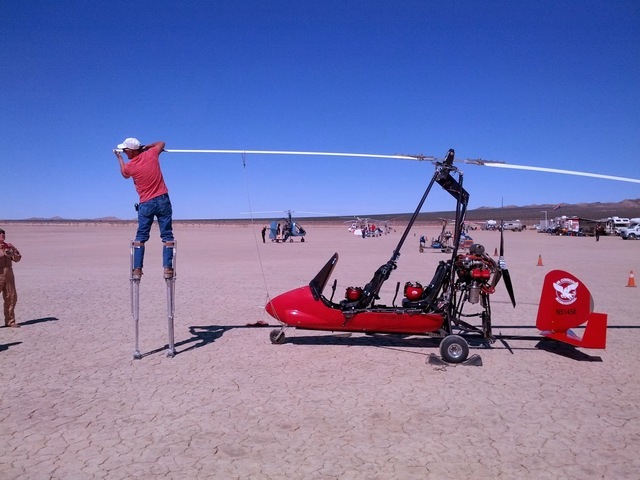 Terrafugia - makers of "Roadable Aircraft"
NB: Some of these flights have been with my friend, and instructor, Scott Stauter. While Scott is a great primary instructor his specialty is Instrument Instruction (I got my Instrument Rating with him). He also offers Mountain Instruction, Multi-engine, and special XC trips such as those listed here. In May 2014, I did a solo ferry flight of a Cessna Skycatcher from Michigan (near Toledo, OH) to Palo Alto CA. Since the Skycatcher is not IFR certified, and its light weight makes it susceptible to winds and turbulence, I decided that a route across the Rockies and Sierras was not in the cards. I therefore chose the southern route through Texas, New Mexico, Arizona, and then back up through Southern California. Unfortunately, nearly the entire trip was fraught with weather issues, including low clouds, thunderstorms, tornados, hail, winds and turbulence. But in the end I made it to Palo Alto no worse the wear on me or the aircraft. You can see some photos from this trip on my Google+ album Skycatcher Ferry Flight May 2014. Richard and I spent three days flying to a number of airports in the Mojave Desert and Palm Desert areas. We encountered some interestng winds, including a 50 KT mountain wave between Needles and Chiriaco Summit. Flying solo IFR can be demanding, sometimes more demanding than others. Here's a link to a story about a brush with danger that I had while flying through the Cascades near Medford Oregon. I spent 3 days flying with acrobatic legend - and all around great guy - Wayne Handley in his Extra 300L. My initial goal was to feel more comfortable with unusual attitudes and to increase my confidence and skills in such situations. Much to my surprise Wayne not only helped me achive these goals but he also taught me how to do - even enjoy! - various rolls, loops, and other acrobatic maneuvers (something that I never would have thought possible since even roller-coasters make me sick). 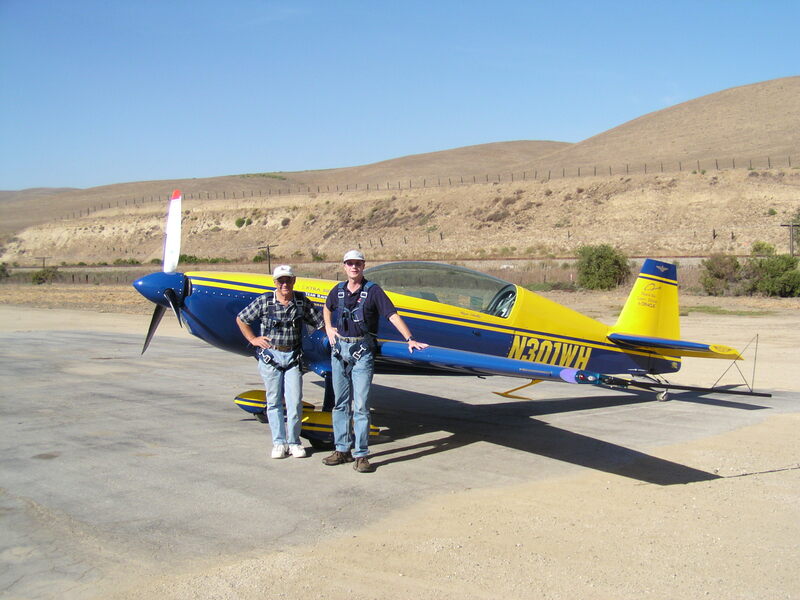 I would recommend flying with Wayne not only to those who want to expand their acrobatic repertoire but to any pilot who wants to expand their envelope of comfort, confidence, and skill. 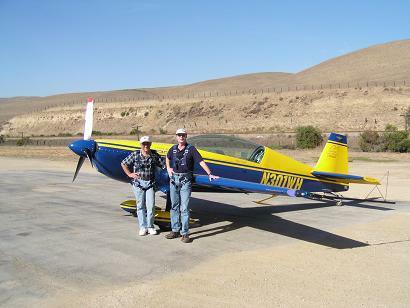 Here is a link to the full article about my experience: Aerobatic Instruction with Wayne Handley. In 4 days we covered 5 states, 12 airports, and 2240 miles; including Leadville (9927') - the highest elevation public use general aviation airport in the US, and Telluride (9078') - the highest elevation airport in the US with commercial passenger service.